For anyone but the most incapable of reading between the mainstream media lines it’s been obvious that there has been a vicious propaganda war going on against Jeremy Corbyn ever since he became the star of the show during the 2015 Labour leadership election. Now there is some serious academic research to back it up too. 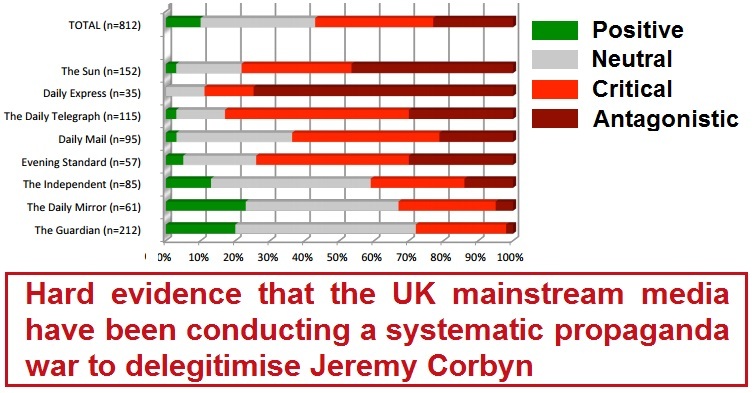 The London School of Economics has produced a report called “Journalistic Representation of Jeremy Corbyn in the British press” that demonstrates the existence of an extreme systemic bias against Jeremy Corbyn in the corporate mainstream media. 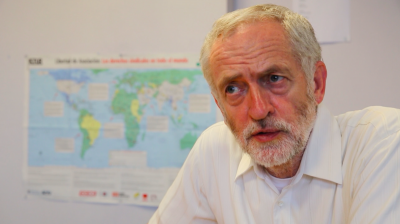 The report analysed hundreds of articles about Jeremy Corbyn in the mainstream newspapers and identified three main delegitimisation propaganda tactics used to attack Jeremy Corbyn. Almost three quarters of all stories failed to accurately report Jeremy Corbyn’s actual views on subjects. 52% of all newspaper articles didn’t mention Corbyn’s actual views at all, while another 22% misrepresented his views or took them out of context. Only one in five Daily Telegraph articles about Jeremy Corbyn even bothered to quote anything he had said whatever. The worst offenders at misrepresenting Jeremy Corbyn’s views/policies were the Evening Standard (39% of articles), Express (37%) and Telegraph (29%). In the period between September 1st and his election as Labour leader on September 12th an astonishing 42% of all newspaper articles attempted to frame him as a communist. 0% of Daily Mail and Express articles presented Jeremy Corbyn’s views/policies without alteration. The average across all newspapers was just 11%. 22% of all newspaper articles designated Jeremy Corbyn as “dangerous”, rising to 50% of articles in the Telegraph and 63% of articles in the Express. 27% of Daily Mail articles portrayed Jeremy Corbyn as hating Britain (which is ironic given that the hard-right Tory ideology he opposes has seen massive swathes of British infrastructure sold-off to foreign interests). All newspapers ran significantly more critical articles than positive ones, including the supposedly left-liberal Guardian, Mirror and Independent. On average over 50% of articles about Corbyn were negative or highly critical, while less than 10% adopted a positive tone. 80% of Daily Express articles about Jeremy Corbyn used ridicule and scorn to delegitimise him. The other worst offenders at using ridicule tactics were the Daily Mail (54%), Evening Standard (47%) and Sun (45%). The worst offenders at publishing personal attacks were the Express (40% of all articles) and the Evening Standard (26%). The supposedly left-liberal Daily Mirror and Independent newspapers were far more likely to include quotes from anti-Corbyn Labour politicians, than quotes from those who support him. 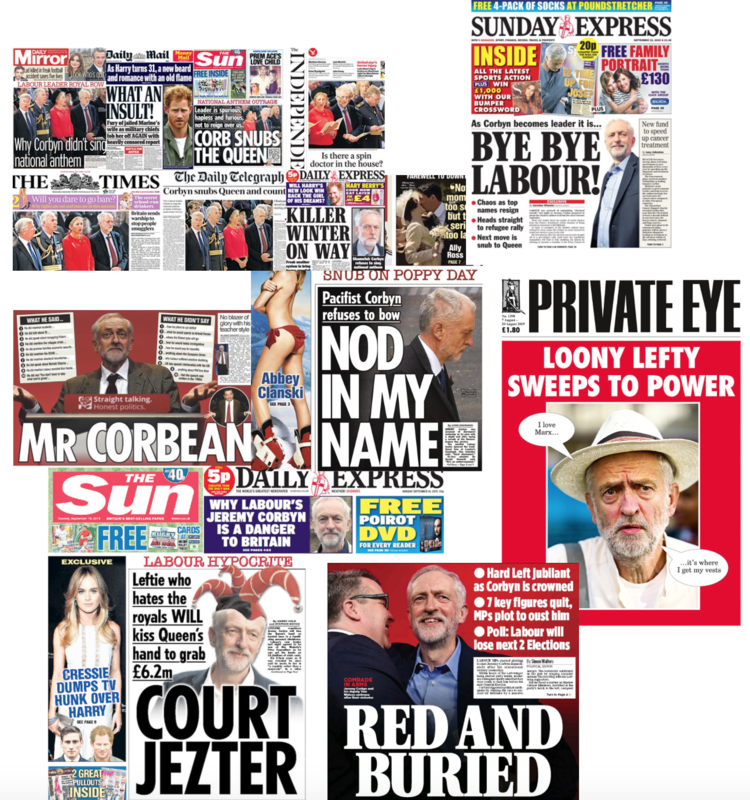 It’s quite extraordinary to see the mainstream press who have spent the last year systematically misrepresenting, ridiculing, abusing and bullying Jeremy Corbyn jumping on examples of abusive behaviour (many of them hugely exaggerated or entirely fabricated) in order to portray Jeremy Corbyn as the leader of a pack of thugs.The tide of mainstream media support for the botched anti-democratic effort by Labour coup plotters to bully Jeremy Corbyn into resignation (which included a Daily Mirror front page demanding he quits) shows how much the press pack continue to hate and fear him. The corporate newspapers still command a huge amount of power to shape the parameters of political discourse. The mainstream media trope that Jeremy Corbyn is “unelectable” has been rote learned and repeated so often that it’s simply accepted as a folk-truth by millions of people. The new trope that the savagely authoritarian right-winger Theresa May is “a safe pair of hands” is already doing the rounds, and being mindlessly repeated by people who know nothing about her six year track record of authoritarianism and incompetence at the Home Office. Just as the mainstream press are on a mission to delegitimise Jeremy Corbyn as much as they can, they’re determined to gloss over Theresa May’s appalling track record and sing her praises, and the sad fact is that blatant propaganda tactics like this work a treat. After 10 months of extremely biased anti-Corbyn press coverage his approval ratings are at an all-time low, while an incredible 55% of people are positive about Theresa May becoming Prime Minister despite her utterly toxic track record at the Home Office.